My cousin had adopted these birds, which was given to my brother by someone. 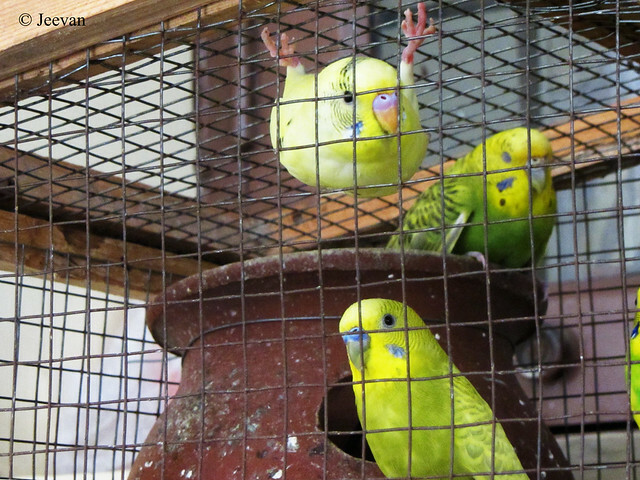 I denied allowing him to grow these birds – Budgerigar – at home, not only that I don’t like to see birds in cage, when they have wings to fly, it also used to smells foul and tiny hair of their feathers spread around and infectious. It seems these birds don’t know how to survive if uncaged and let fly into the environment. I remember once a crow was chasing a budgie (also known as common pet parakeet) in our neighbourhood which was supposed to be escaped from a cage and these birds seem to breed as only pets and caged birds, so there experience on the environment is none. These birds are scared being and the couple of days they had been at our home, made outcries when cats arrive close to the cage and they all hide inside the pots. Many misunderstand these birds as lovebirds, including myself until revealing it (as Budgerigar) through Google search. After I started to show interest on bird watching, which began with the place/house I shifted ten years back – with open vegetation in front of the apartment home – though we aren’t staying over there and the vegetation also turned into an apartment complex now, I love to see birds in their natural state and environment. My many visits to the Western Ghats (the second largest and continues range of mountains next to Himalayas in India) inspired me to look for birds and I have shoot some of them including the endangered bird species – The Great Indian Hornbill – which memory is still vivid and I consider it precious! 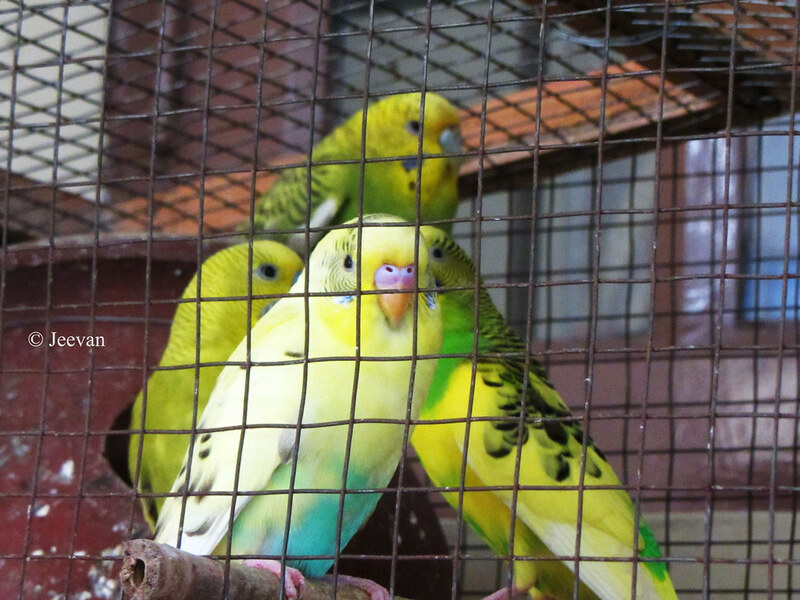 Being enjoying birds in the natural environment, couldn’t able me to appreciate birds in cage. I think many buy these birds are not in state of loving the species, but to maintain a status and showcase an illusion that they love birds. I’m not complaining, but expressing my thought and anxious about the birds in cage. 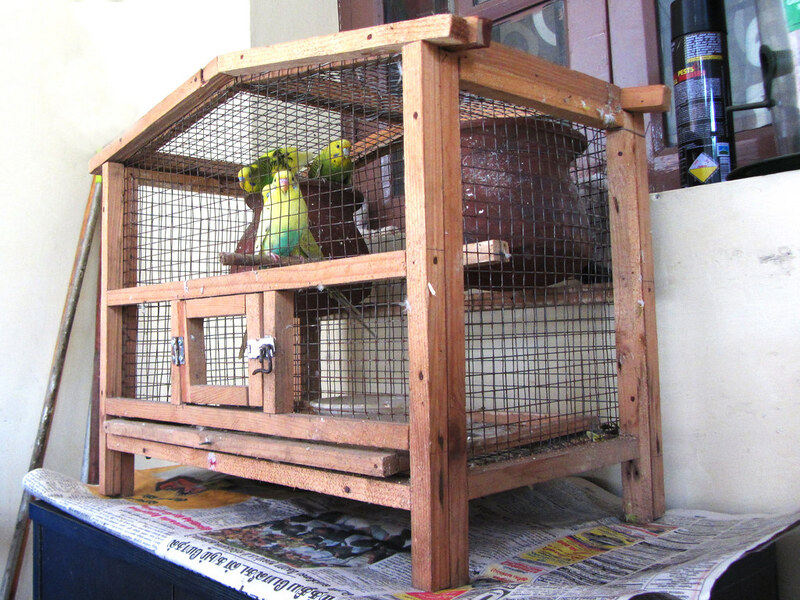 There’s a house at the rear of us, holding couple of cockatiels in cage (the second bird species that popularity only to the budgerigar as a caged bird) and after shifted their home they left the birds in charge of following tenant. During the recent historic rain, the birds were left alone and perhaps suffered since the resident were out of city, we had no way to check their need but just watched through the window the bird are alive. I heard the birds where bought to exhibit to the child of the former whose age was about to be 1! I wonder what the kid at that age would know about birds. I think it’s better late than ever and to preserve the birds left in our environment, the only option is observing or looking for birds. The tiny species House Sparrows are almost exited the city, though we complain about mobile towers and others, I feel we haven’t consider them as a member of our house and we build home for the comfort of our lives alone leaving no favourable place for them to nest and feed on grains. Perhaps many of our food habits are transferred to what birds eat – millet – and the price of them have also risen. Although it doesn’t sound logic, in some way we rejected birds for them to disappear from the sight and what we really need are not birds in cage, but to trace back the environment where birds enjoyed the freedom at cosy and a backyard with chirping birds. Let’s begin with the kids, teaching them how to enjoy birds in natural state and surroundings. Hello Jeevan, I agree wild birds belong wild and free. They do not belong in cages. But, if a bird like the Budgie is raised from birth in a cage they do not know how to survive the elements and fend for themselves. Teaching children to enjoy the wild and free birds is a good start. Great post! Thank you for linking up and sharing your post. Have a happy weekend! You have interesting thoughts about birds in cages, Jeevan. I personally prefer birds to be wild and free, but I suspect some people would have no other contact with nature if it weren't for caged birds. :) Sad but true. I agree with you. They belong outdoors, being free. Our winters are too cold for them, and if they escape pet owners, they die or get killed by predators. Yes Jeevan you are right. Free birds are better and makes us more happy. I too don't like to see caged birds. There is one house in our street which keeps so many birds inside a single cage! But the issue is, we are destroying all the nature around is in such a frantic pace that there is no other place for many birds to live in! I too agree with you that they should be free. If you get a chance, you may want to watch the documentary, "Parrots of Telegraph Hill". Some of these birds can adapt to colder temperatures, although not to the cold Ontario weather, like Jennifer A. Jilks has pointed out. I had a few birds in my apartment, when I didn't know any better. Eventually, they all left their bodies and I don't have any more. Have a Beautiful Week, Jeevan! They do not look good in cage. It is always joy to see them free. Let them fly . Nice to find your page . I remember when birds like this were set free in a large botanical dome. The multiplied and loved living inside among the palm trees. Eventually they did so much damage that they had to remove them from the environment by trapping them. Birds are sad when they are caged for life. What at their wings for?